The Kym Green Bush (KGB) training method is a renewable multi-leader bush system. 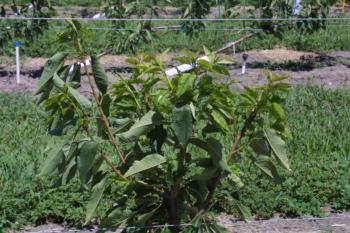 Typical spacing on a semi-dwarf rootstock such as Gi6 is 16 to 18 feet between rows and 6 to 8 feet between trees. 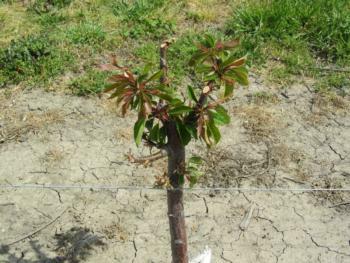 On a full-sized rootstock such as Mazzard the usual spacing is 18 by 10 feet. Trees are headed to 24 inches tall at planting. If new shoot growth is adequate, head the shoots back to 4 to 6 inches long. Then, after 24 inches of subsequent new growth, again cut new shoots back to 4 to 6 inches. 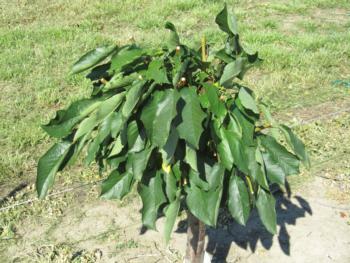 After two heading cuts the tree should have about 20 shoots, which is enough for a tree grown on a semi-dwarf rootstock. 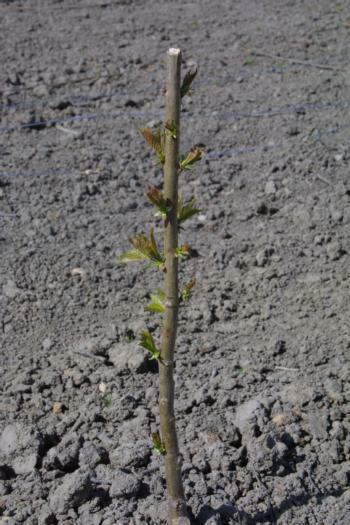 On a full-size rootstock such as Mazzard, a third heading cut will be needed so that a total of 30 branches are formed. 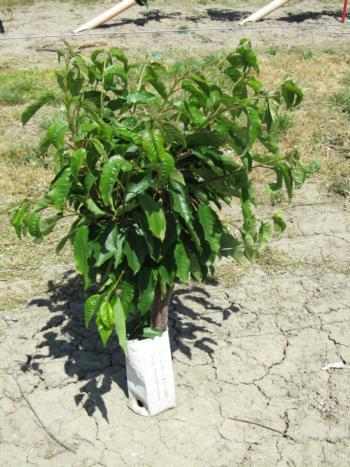 Ultimately, 12 to 15 upright leaders will be left on a tree grown on a semi-dwarf rootstock and about 25 branches on a tree with full size rootstock. To this point this training system is identical to Spanish bush training. With the Spanish bush system, the upright leaders are permanent and fruit is borne on the renewable spurs and lateral branches. With KGB, the development of lateral branches is de-emphasized and the fruit is produced on the renewable upright leaders. KGB tree planted March 2010 and headed at 2 feet. KGB tree in July 2010, a month after the first heading cuts were made. These cuts are made when shoots are about 24 inches long - usually May or June. KGB tree cut back to stubs to produce more low branches, April 2011. Ideally, new shoots produced after then June 2010 cuts would be headed when they reach 24 inches - preferably mid-summer or early the next spring, but the decision was made to stub the main branches again to produce more branches. This delayed production for a year. New spring growth on KGB tree, May 2011. Shoots cut back on KGB tree, mid-June 2011. This is the final severe pruning, which should ideally be done a bit earlier in order to produce more basal flowering the next spring. Four KGB trees on Gi6 (right), August 2011. 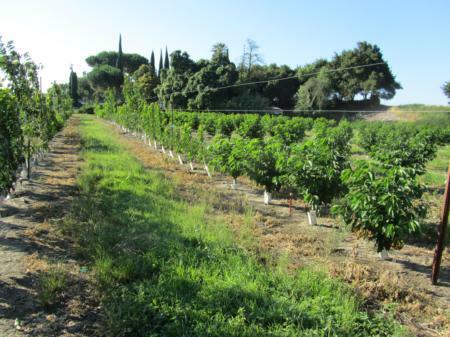 In the background on the right are three rows of Benton trees on Krymsk 6 rootstock with KGB training, with identical timing of planting and training as trees in the experiment. Krymsk 6 trees are larger than all the Gisela trees. Beyond the Krymsk 6 trees are 3 rows of trees on Gi12, then 3 rows on Gi6, which are the smallest the trees on three rootstocks. The levee and River Road are on the right.